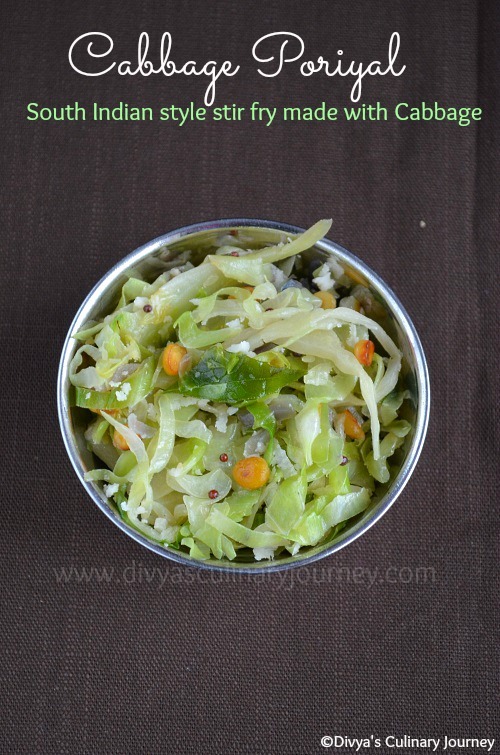 Today I am posting a simple and healthy stir fry recipe- Cabbage poriyal. It takes just few minutes to prepare this stir fry. It can be had with almost everything Rice & Puli kulambu, Rice & dhal, Chappathi and I use leftovers to make sandwich too. Green chillies, 2- 3 nos. Heat oil in a skillet and add mustard seeds and when they crack add channa dhal and fry for a minute, then add the chopped onions, green chillies and curry leaves and fry till the onions turn translucent. Then add the shredded cabbage, salt to taste, sprinkle little water and mix well and cover and cook, cabbage has water content so it doesn't require much water to be added to cook. I don't add water at all to cook. But stand near it to stir it to avoid it burning. Also cabbage gets cooked in minutes. Once it is cooked, turn off the heat. Add shredded coconut and mix well and serve it. I have shredded the cabbage using food processor. You can finely chop it too. Instead of green chillies you can use red chillies too or even the combination of both. You can add a pinch of turmeric too to this stir fry. My mom adds it. love that it has still green color. 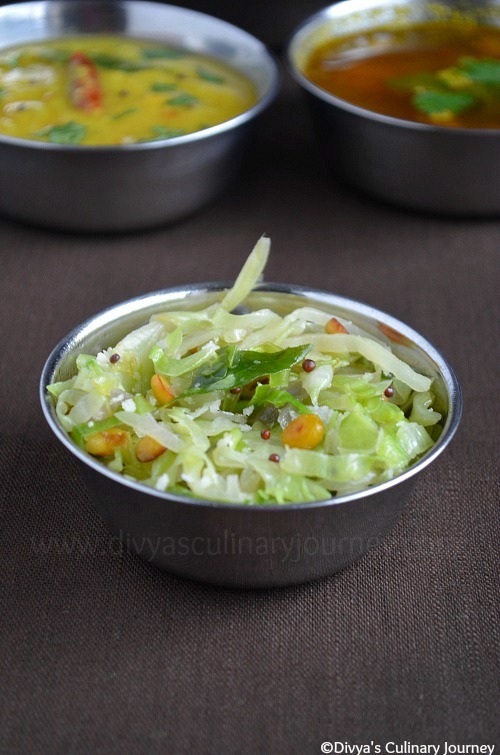 perfect side dish or main dish with roti. My all time favourite stir fry, love it with anything. Love this fry always. Looks delicious. Quick and yummy stir fry. my fav stir fry..looks so perfect..